Enjoy audiophile fidelity from your iPhone. Nearly a decade of AudioGate innovation has led KORG to create the finest high -resolution music player: iAudioGate. KORG was among the first to embrace the potential of high-resolution DSD audio for recording, for archiving, and for pure listening enjoyment. From rack-style studio recorders to portable solutions and hand-held devices—as well as USB DAC and player/converter software—KORG has led the charge to create a generation of DSD hardware and software products to satisfy audio lovers everywhere. 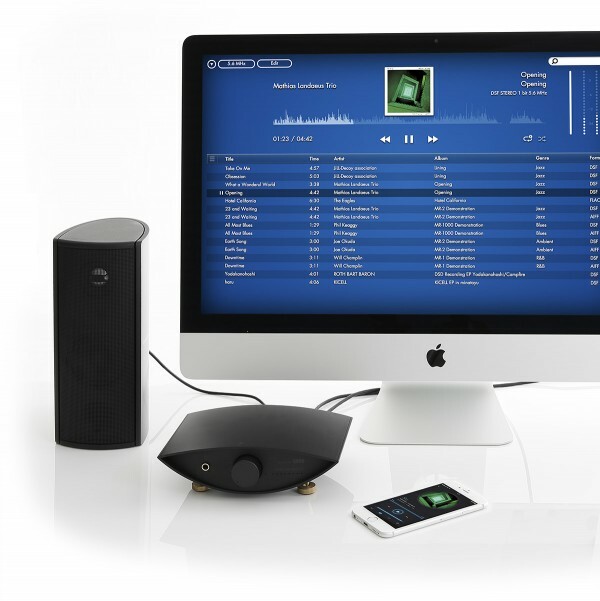 Launched in 2006, the AudioGate PC music player quickly became a blockbuster success. AudioGate combined versatility and fidelity with a user-friendly interface, taking the power of DSD out of the hands of the audio elite and making it available to a diverse world of enthusiastic listeners. Today, AudioGate commands an overwhelming share of the DSD player market. KORG, awarded Best of App 2014 (Japan) by Apple, is proud to announce that iAudioGate, the groundbreaking high-resolution music player, is now available for iPhone. iAudioGate has been fully loaded with the AudioGate player engine and customized to perform as an iPhone app. 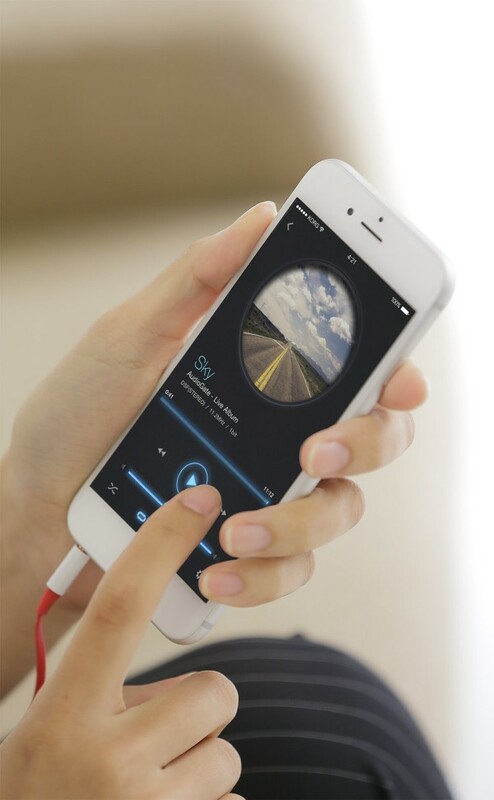 Aside from the immaculate sound quality, the iAudioGate application incorporates the best features of an iPhone app, such as a stylish interface and a simple-to-use graphic equalizer. Create, capture, and experience the supremacy of sound made possible by KORG. For KORG, the ultimate achievement is the faithful reproduction of sound as it was intended by musicians and engineers—and for the delight of the listeners who savor it. Experience the ultimate sound that until now was unavailable from a mobile system. Plays nearly all file types—including high-resolution audio, DSD, FLAC, MP3, etc. High-resolution audio sources have higher sound quality than a CD and greater detail, delivering sound that’s close to the original. Conventional music players do not support high-resolution audio source formats, or down-convert the data to CD quality for playback. 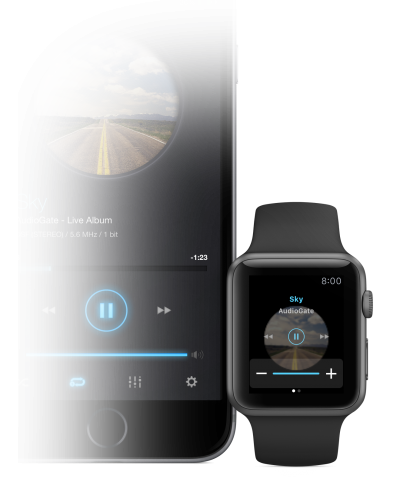 iAudioGate supports a wide range of formats in order to play back high-resolution audio sources at their full quality. Even when performing conversion, the optimal type of processing is performed for each specific file format to deliver the highest quality of sound.  In addition, a wide range of sampling rates up to 11.2 MHz DSD is supported, allowing direct playback without conversion processing, and even up-sampling, optimally controlling for all sound sources. High-resolution audio sources possess a higher level of sound quality than that of a CD. In addition, they contain greater detail and are far better at preserving the ambience of the original recording environment. The benefit is a listening experience that is incredibly faithful to the original. Conventional music players do not support high-resolution audio source formats—or they simply down-convert the data to CD quality for playback. iAudioGate supports a wide range of formats in order to play high-resolution audio sources with the greatest degree of accuracy and the highest fidelity possible. During conversion, the optimal type of processing is performed for each specific file format to achieve the finest quality of sound. A wide range of sampling rates—up to 11.2 MHz DSD—is supported, allowing direct playback free from conversion processing. Effective up-sampling operations yield enhanced audio performance from all sound sources. As an app born from file-format conversion software, KORG has unsparingly endowed iAudioGate with the same exacting playback engine featured in AudioGate—the industry standard software for DSD playback and conversion. The sampling rate conversion filter has been carefully designed to enrich each specific combination of sampling rates, and also takes into account the characteristics of the A/D converter and D/A converter themselves. The original AudioGate realtime playback engine has continued to advance day by day, and is fully realized in iAudioGate. Audio files exist in a variety of formats. iAudioGate supports a vast array of audio formats such as MP3, AAC, and 44.1/48 kHz WAV; high-resolution audio sources such as 96/192 kHz WAV and FLAC; as well as 11.2 MHz DSD. iAudioGate remains in complete control of entire conversion process, so it can flawlessly playback songs that differ not only in their bit depth or sampling rate, but it can also handle playback chores that contain a mix of different file formats. 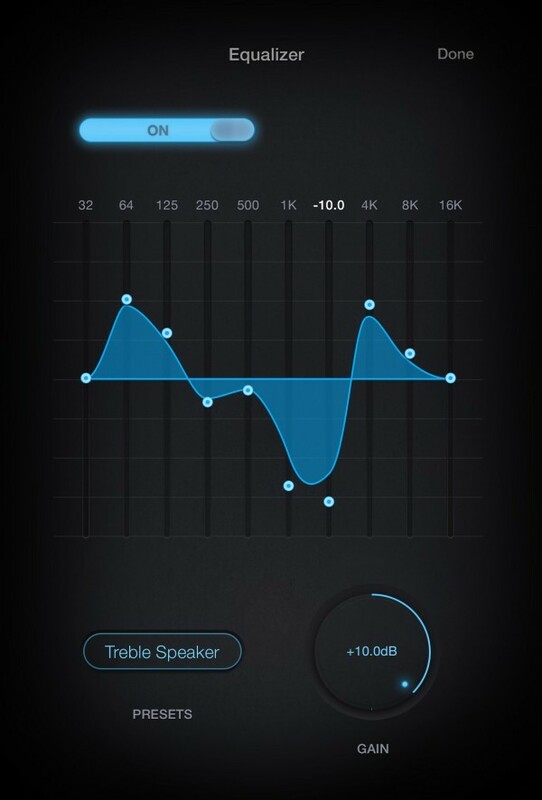 The tonal response of all iAudioGate formats—including high-resolution audio sources—can easily be custom-tailored using the onboard graphic equalizer and intuitive fingertip controls. Careful attention has been paid to not only the audio performance, but to the physical ease of operation one expects from an iPhone app. You can draw the EQ curve with a single stroke, and then go back to make detailed adjustments, little by little. Once you&apos;ve experienced this ideal type of EQ control, other equalizers will pale in comparison. * The equalizer does not support DSD native playback, or up-sampling to DSD playback. Meticulous attention has been lavished not only on the superior audio quality of the iAudioGate, but to the graphics and user interface as well. 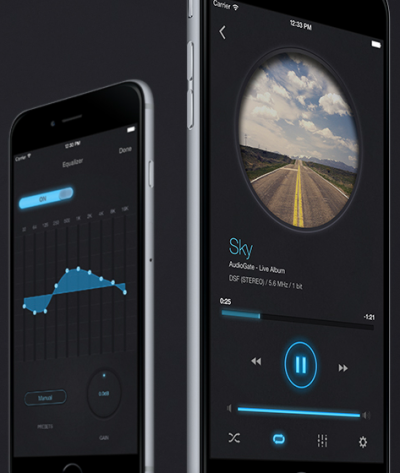 As is befitting an app designed to reproduce audio using the highest possible resolution, the compelling interface complements the sophisticated design sensibility of the iPhone, and has been honored by Apple Corporation as Best of App 2014 (Japan). This achievement has been made uniquely possible by KORG’s expertise in both sound and app development. For the pinnacle of home audio enjoyment, KORG recommends the combination of the PC (Mac/Windows) version of AudioGate combined with the KORG DS-DAC series. This allows the creation of an uncompromising listening environment with excellent management of even high-resolution audio sources that tend to occupy significant storage space. 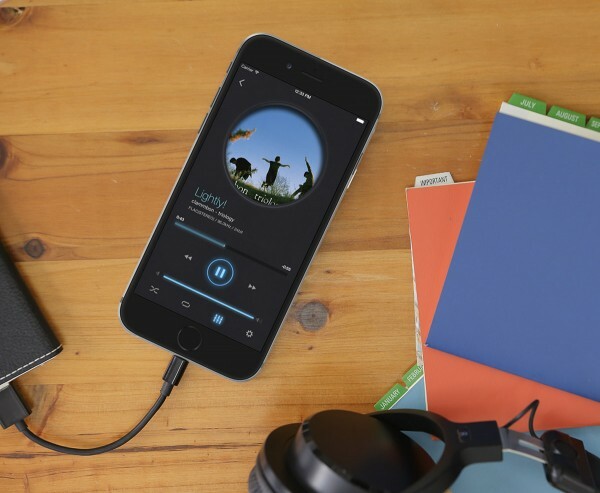 Your favorite high-resolution audio sources can be easily transferred via AirDrop, iCloud Drive, Dropbox, Google Drive, One Drive, or iTunes right to your iPhone. 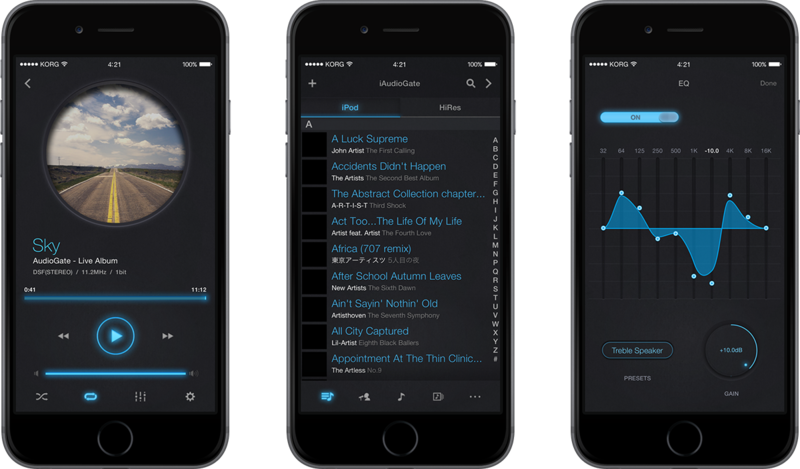 Thanks to iAudioGate, you can take high-resolution audio sources with you anytime, anywhere. * If you use The KORG DS-DAC-10R, y ou must use a compatible connection kit/adaptor made by Apple, and provide power from a USB hub that is equipped with a power supply. * The KORG DS-DAC series which are DS-DAC-100, and DS-DAC-100m are DAC units for desktop use only. These do not support iOS and iAudioGate. You can use Apple Watch to remotely control iAudioGate. Play, stop, fast-forward, and volume changes can be controlled with a simple touch. Artwork and other song information for the currently-playing song are visible at a glance. You can even switch between equalizer presets. Don’t miss this opportunity to enjoy a cutting-edge mobile listening environment. * The display is equivalent to that of the iPhone. * The iAudioGate's DSD playback functions may be limited by each iOS device due to CPU performance. * Not compatible with files protected with DRM. 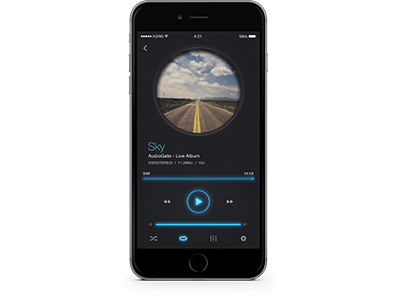 * The software converts sound to 44.1kHz or 48kHz when iPhone plays back independently. * Compatible with DSD native playback with DoP. * iPad, iPad Air, and iPad mini are trademarks or registered trademarks of Apple Inc.
iAudioGate for iPhone is available on the App Store.